I do not think it is politically realistic to build 201 new overhead lines in Europe. Furthermore such lines are extremely vulnerable. It is very difficult for me to not see this as a backward looking plan in terms of technology. I believe it is absolutely critical for the main legs of the future European supergrid to be underground lines carrying more than 10 GW. As I have said in prior posts, the maps that have been published of the European supergrid really imply that each line has to carry tens of gigawatts at least. In a way there is a big lie being promoted, since the maps that are shown of the European supergrid do not show the spaghetti tangle of overhead powerlines that actually would be required to implement the supergrid using current technology. I fully understand that this plan is following previous precedent, in that only fully proven technologies make it into the plan. I could understand that for the next five years, but I am opposed to this being applied to the out years, especially since you can show that we will never achieve our results with current technology unless the concerns of environmentalists are completely overruled. We absolutely need an underground transmission and technology that can move tens of gigawatts per line. Furthermore, since the ultimate solution will involve a multi terminal HVDC grid, many of the plan projects will become outmoded whenever we finally do get that grid. We should at least be taken care that the projects were building now will ultimately fit into the supegrid in the future. Americans care about both renewable energy and overhead powerlines. We need new powerlines to allow renewable energy to displace fossil fuel. The utilities keep saying they cannot be put underground. This is only true because neither the utilities nor DOE does anything to develop or study underground options, like elpipes. A little pressure on this could have huge effects by de-bottlenecking remote energy site development across the US. Look at the following blog entry in order to follow-up on this. This is an article that I am working on with my friend Tord Eide and a Norwegian professor from NTNU. A debate rages at this very moment about whether Norway should connect strongly to the European electrical grid or use its abundant hydropower resources just for Norwegians. We argue that using Norway's vast hydropower resources as the battery of Europe would make a vital contribution to the decarbonization of the world's future energy economy. This does not require Norway to sell its energy supply, but simply allow existing hydropower reservoirs to function as reversible batteries. This is Norway’s chance to think in scale and actually be a major contributor to affect the global climate. In order to actually become the battery of Europe, Norway needs a lot better electrical connection to the rest of Europe. The best way to accomplish such a connection is with a supergrid. A supergrid is a continental scale high-voltage DC (HVDC) grid, and this could be accomplished either with overhead powerlines or underground powerlines. Underground cables however are not up to the task because of their limited transfer capability per cable. This limitation is not likely to ever be overcome, because it is based on the simple fact that cables have to wrap on a reel in order to be transportable, and that limits the maximum diameter of both conductor and insulation per cable. With presently proven technology we would have to build a lot of of new overhead power lines to make a European supergrid; this is precisely why the southern part of Germany is not strongly connected electrically to the northern part of Germany at present; large new overhead power lines are simply politically impossible in Europe today. Underground cables are not a solution either, as their capacity is typically limited to about one gigawatt (1.0 GW) per cable. New technology is needed, capable of carrying more than 10 GW underground. There are four developmental technologies that could work for building an underground supergrid in Europe including two different flavors of superconducting lines (one which needs to be cooled with liquid hydrogen or helium, the other which may be cooled with liquid nitrogen), gas insulated lines (GIL), and the elpipe (the newest technology in this list). Figuring out which of these underground options is the best solution for creating a European supergrid should be a research priority in Europe, but that has not been the case. So far, the research has been driven by commercial entities with products they want to sell. Siemens has maintained a research program looking at GIL transmission of HVDC power, as well as AC, and ABB he was also active in this area up until 1999, when they sold their technology to US corporation AZZ. ABB also has an active program for HVDC cables. Transitioning to a non-superconducting state can be instantaneous and can be triggered by a current that is over a limit even for a microsecond. This can lead to a catastrophic plasma explosion if the line is carrying a lot of current. the maximum practical voltage for a superconducting DC power line is around 130,000 V due to the difficulty of insulating under cryogenic conditions. this is an unsuitably low voltage for conventional HVDC, so in a sense superconducting lines don't play well with the existing technologies. Superconducting lines have no damping properties. that means that resonances do not damp out. This is a critical threat to reliability. every junction between the superconducting lines and the conventional grid is a high maintenance and difficult installation, the failure of any one of which could bring down the grid. Keeping the number of such junctions to a minimum is absolutely required. It is very difficult to maintain cryogenic conditions reliably, and at all times (which might include times of national disasters such as widespread flooding or earthquakes). Superconducting powerlines, which have often been proposed for long distance power transmission, are far from being practical at this point, and the other major industry sponsored powerline concept that could have adequate power transfer capability for a supergrid (GIL), has the fatal flaw of relying on an incredibly potent and practically immortal greenhouse gas for insulation, sulfur hexafluoride. Both superconducting powerlines and GIL powerlines suffer from poor repairability in terms of the time it would take to repair a major fault. (When something as important as a 10+ GW powerline fails, it is critical to be able to repair it in hours, not days.) Failure modes for both GIL and superconducting lines are very difficult, potentially resulting in many days long outages. The elpipe has been successfully patented around the world, in spite of the fact that one has never been built. This happened because the elpipe is so firmly based on well-established physics, that the patent examiners admitted it as new invention without ever having had a working model built. This is quite an achievement in itself, and it is a testament to the simplicity of the idea. It is a shame that such an innovative technology has not been able to find funding. The elpipe has unique features related to repairability. Such technology can be utilized to build an underground European supergrid, and a European supergrid is absolutely required in order to have a renewable energy future for Europe. Even if there were no bottlenecks in transmission, the installed hydroelectric power capacity of Norway (~30 GW) is not large enough to truly serve as the battery of Europe. Something on the order of 100 GW of energy storage power capacity will be required to allow for 100% renewable energy generation in the mix for Europe. However, if more turbines were installed, the energy storage in existing Norwegian reservoirs (80 TWh) could make a significant contribution to solve the European challenge. A proposal from the research center CEDREN described a step towards becoming the battery of Europe in the form of 20 GW of new pumped storage turbines to be installed on existing Norwegian reservoirs, combined with several new power lines and subsea power cables to European power nodes. These new power lines would cause most of the environmental and aesthetic damage to Norway, and would represent about half of the total cost. We recognize and understand the resistance of Norwegians to these new powerlines; indeed similar resistance throughout Europe to overhead power lines makes such schemes politically impossible. We propose a much larger concept for Norway becoming the battery of Europe than any prior proposal, based on HVDC loops, enabled by elpipes, and capable of exchanging much more stored energy with Europe than has previously been contemplated. This scheme however will produce far less environmental and aesthetic harm because it uses underground electric connections (elpipes and cables). We must get beyond the paradigm that power moves through power lines from node to node; continuing in that paradigm would mean that for Norway to become the battery of Europe, we would need at least 20 new power lines connecting us to our neighbors. Most such interconnecting power lines will become outmoded (stranded assets) in the future scenario of having a European supergrid. If one compares the environmental impact and cost of installing more turbines on existing reservoirs to the environmental impact and cost of building new energy storage facilities, it is clear it would be far more desirable environmentally to use the existing reservoirs rather than flooding new valleys (in the case of hydroelectric energy storage), or mining the resources required for manufacturing and installation of batteries (for electrochemical energy storage). Building new hydroelectric power capacity based on installing new reversible turbines on existing Norwegian reservoirs would create additional storage capacity without having to build any new reservoirs. The main unavoidable environmental impact for this scheme would be that the levels of the reservoirs would be changing more quickly than they are today. That makes it hard for many varieties of fish to reproduce. We propose floating structures in the Lakes to mitigate this. The tunnels, turbines and generators that would be required could all be installed underground. In order for Norwegian power to truly work as the battery of Europe, the power must be deliverable, and power flow must be controllable at many different connected power nodes inside Europe, ideally with millisecond level control of power flow into or out of each node. None of the currently proposed schemes, such as Figure 5, taken from the Nordic grid development plan 2017 which all involve point-to-point powerlines, would accomplish this. Figures 1 – 4 on the other hand do accomplish this. (See figure 3)...This could be copied and pasted here, or perhaps a few of these sorts of maps. Although the Nordic grid development plan 2017 does enable increased power exchange with Europe, it uses the same old paradigm used for all such prior projects in which point-to-point power lines are used for purposes of transferring power. Any such point to point power line necessarily relies on the underlying AC grid to provide redundancy in case of a loss of a line.The ability to withstand the loss of any one power line or generator without a crash is a fundamental rule for electrical reliability of any large grid.This is the so-called “n-1 rule,” and strictly limits the maximum size of any power line in the grid. Following the current paradigm, it will be necessary to have about 20 new powerlines linking Europe to Norway just to get to the 20 GW capacity called for in the CEDREN plan (Figure 2). Figure 3 shows a first stage high-voltage DC loop–based transmission system map based on elpipes; this represents a logical first step towards a European supergrid. The nodes shown inside Norway and Europe are actual large transformer yards that already exist in the AC grid. The routes shown for the HVDC loop other then the portions of the loop that cross the Baltic Sea are all existing rights-of-way; some are power line rights-of-way, and others are gas, oil, railroad, roadway, or water pipeline rights-of-way. The nodes are mostly very large transformer yards near large power plants. Figures 1: map showing the layout of HVDC loop that connects Norway to Germany. This example will show just a single loop, enabling power exchanged between four nodes or so in Norway and 10 or so nodes in continental Europe. Pick the node points as the locations of very large transformers. The total sum of all of these transformers should have a capacity greater than 20 GW. Most of the big transformers will occur at large power plants, although there are a few crossing points where there are also a lot of transformers and there is not a Power plant.Try for Transformer yards with greater than 1 GW of capacity. Consult my paper suggesting a grid in Europe just within the boundaries of Germany. I drew that map based on the locations of nuclear power plantsIn Germany. By definition those power plants needs large transformer yards. The nodes in Norway conveniently located to access the largest pump storage reservoirs in the country. Figures 2: map showing the layout of Figure 1 + additional features. HVDC loops would be added that went through Sweden and over to Denmark and making a logical return to the original loop somewhere in Germany,Possibly extending as far as the existing HVDC power line to Great Britain. Four Or so nodes would be added in Sweden, Several in Denmark… You get the idea. It really depends on the grid structure. I happen to know that several universities have posted the European grid in map format and it also includes power capacities and Transformer capacities. My former employee found all that stuff but never documented it for me then he quit and now I don't know where that information lies except it is in several different European universities. With that data I can ask my expert friend to figure out where the best points to put these nodes are. But I don't want to wait for that now I want to get something that looks reasonable and that is tied into real nodes and real rights-of-way that really would connect Scandinavia with Europe. I want to know the actual length of every segment of these maps. The next example figure 3 Links to the loop through Denmark somewhere, and then travels in a manner through France as to tie in all of their nuclear power plants… or at least most of the ones in the north of France, and then it precedes to meet up with the German loop. figure 4 Links to the German loop And the Norwegian like this loop to extend into Russia, and access died Joe Power capacity of Northern Finland if there is any there actually I don't know that myself. Showing several levels of the concept would allow us to show the evolution of the elpipe–based supergrid starting from the very first HVDC loop up to a recognizable supergrid. Figures 5 and 6 Show plans for connecting Norway to Europe that are on the books today or are being proposed by major utilities or European environmental groups. These figures show a series of a point to point connections That are dramatically less useful than if power from any point on a loop can be transferred to any other point of the loop as is the case in the HVDC loop systems of Yes. Contrast the plans of Figures 1 – 4 with the plans of Figure 5, which is taken from the Nordic Grid development plan 2014, or Figure 6, Which is taken from the CEDREN Report. Figures 1 – 4 are based on interconnecting HVDC loops; a loop is uniquely redundant in that every node food on the loop is connected to every other node on the loop via at least two independent power lines, the clockwise and the counterclockwise. The HVDC loop systems of Figures 1– 4 are comprised of large HVDC loops that are self redundant in the sense that power between any two points on the loop can be delivered either in the clockwise or the counter clockwise direction. (For this to work, one needs very high power HVDC circuit breakers between next–neighbor power taps on the main lines of the super grid.) Redundancy levels continue to improve as more interconnected loops are formed as in Figures 2– 4, for example. Point to point HVDC connections linking to large power nodes of the AC grid will never achieve this key property, that of being redundant strictly through the HVDC continental grid overlay. Only when the DC continental grid provides its own redundancy will it be possible to trust an individual line with power flows in the tens of gigawatts, as will be required for the European supergrid to be a reality. Note that the proposed conventional HVDC power lines of Figures 5 and 6 will become outmoded in the scenario that there is a future European supergrid (as is actually planned), whereas the conceptual HVDC loops shown in Figure 1 would be a logical starting point for the European supergrid. Covering a large geographical area with a single grid capable of transmitting power from any point in the grid any other point, as can only be accomplished by a supergrid (continental scale DC grid). Such a continental scale grid is necessary in order to spread the weather risk of being cloudy or becalmed. This makes renewable energy more reliable in the aggregate than is feasible for any individual solar energy or wind power installation. There is a trade off between the size scale of the grid and the amount of energy storage actually required; the existence of a continental scale supergrid means that only a modest amount of energy storage capacity plus demand side management capacity is needed for a truly renewable energy future for Europe. One of the largest stumbling blocks to creating a European supergrid has been the necessity for using overhead power lines. Underground cables simply do not have enough power transfer capacity, and will never be economically feasible for this sort of task. There is however one sort of underground powerline that would be practical for the main conductors of the European supergrid, the elpipe. This is a type of polymer–insulated electric pipeline that is much thicker than a cable (capacity of any cable is limited by the fact that it must be manufactured so that it can wrap up on a reel). Because of its potentially much larger cross-sectional area for the conductor, an elpipe can carry the tens of gigawatts of electricity needed. The elpipe also solves the critical problem of the need for rapid repairability, by breaking up the overall elpipe into cars that are readily replaceable because they are on wheeled carriages, and roll inside of a pipeline. The elpipe is the invention of one of us (Roger Faulkner), but we all believe it is a critical innovation for enabling a European supergrid. If we are to base the European energy economy upon renewable energy, an underground power line capable of carrying tens of gigawatts of electric power is essential. That's because a European supergrid is absolutely needed in order to base our economy on renewable energy, and because it is not feasible to build a European supergrid based on overhead power lines. It is of course true that before backing the elpipe, an honest scientific evaluation of all the options including the other three is crucial; in fact it should've occurred years ago. We should've already selected the basic technology for the main conductors of the supergrid by now. Balancing power flow is the main task for batteries in the future renewables–based European grid. Energy storage is absolutely needed to balance variable loads with many non-dispatchable renewable energy sources (wind and solar primarily), if we are to balance the loads without using fossil fuel energy. Pumped storage and dispatchable hydroelectric power plants remain the gold standard for the very high energy end of this energy storage market. Very fast reacting energy storage, such as batteries, capacitors, or flywheels are also needed, but at present pumped storage is far more economical for storing many gigawatt hours of power, as will be needed to make it feasible for renewable energy to be the basis for Europe's energy economy. Pumped storage facilities also last much longer than batteries; about 50 years before major repairs will be needed, compared to typically 5 to 10 years of continuous service for electrochemical batteries before they need to be replaced. An optimal pumped storage plant can be as efficient as 83%; this is better than a lead acid battery and not quite as good as a lithium ion battery (~90% efficient); the longer life and lower cost means that pumped storage is much more cost-effective than any currently available electrochemical batteries. Because the backup power is needed at different places at different times, Norway can serve as the battery backup for Europe only if it is strongly connected to many separated nodes within Europe. The technology to accomplish this, multiterminal HVDC, does exist and it is commercially available from all the HVDC equipment suppliers. The progress towards a European supergrid is painstakingly slow mainly because of the excessive conservatism of the industry and the lack of visionary funding. Given the extreme importance of a supergrid for decarbonizing the European energy economy, this is really a crisis. Perhaps Norway can lead the way by financing an introductory portion of the supergrid that would also enable us to monetize our vast hydropower–based energy storage potential for an environmentally important and renewable national income. All my patents for elpipes and Ballistic Breakers were assigned to Alevo SA, the Swiss parent company of Alevo USA, while I worked there. Alevo SA is now bankrupt, and my patents now belong to Bluehorn SA of Geneva Switzerland, and are effectively owned by Dmitry Rybolovlev, who had been the majority stockholder in Alevo. I still hope to regain effective control of my patents, either through licensing or purchase. As you know, both ALEVO GROUP SA and ALEVO INTERNATIONAL SA – despite having developed a recognized innovative technology – were significantly over-indebted. As opposed to filing for bankruptcy, certain creditors requested a temporary debt moratorium. On November 30,, 2017 the competent Court of Martigny and St Maurice, in Valais, Switzerland granted such a moratorium for an initial period of two months until February 2, 2018. Such a temporary debt moratorium should make it possible to explore alternatives more favorable to creditors than a bankruptcy. As required by law, the court appointed an administrator – Mr. Philippe Lathion – to look after the interests of the companies and the creditors. During the period of the temporary debt moratorium, the board of directors continued its search for new investors willing and able to recapitalize or buy the companies, and thus hoping to save the Alevo group. Unfortunately, these initiatives did not succeed. The failure to secure new investor(s) was partly due to the liquidation of ALEVO Battery Technology GmbH (Alevo’s R&D unit) in Germany through which the assets and employees were acquired by Kristall205 GmbH – a newly formed affiliate of Abalith Holding Ltd., and that the assets of the US subsidiary ALEVO Manufacturing Inc., which was placed under “Chapter 11” protection last fall, were assigned to its creditors and subsequently sold to a third party. Under the above described circumstances, the continuation of Alevo group’s operations was irreparably compromised and only an assets sale seemed conceivable to best serve the interests of the companies’ employees and creditors. On January 25, 2018, the temporary debt moratorium was extended by one month at the request of the administrator, in order to organize the sale and transfer of the companies’ assets. The administrator organized and managed a private auction and accepted the offer made by Bluehorn SA – a newly formed affiliate of Abalith Holding Ltd.
On February 20, 2018 the Court of Martigny and St Maurice authorized the sale which became effective March 13, 2018. In light of the asset sale, the court on March 2, 2018 granted the companies a definitive debt moratorium for a period of six months in order to finalize a concordat (i.e. composition agreement with the creditors). The assets acquired by Bluehorn SA include the intellectual property rights, licenses and patents, as well as the Martigny electrolyte manufacturing facility and the assumption of responsibility for all employees. The price paid for the assets will be allocated to the payment of claims in order of rank; namely in the first place the pledged debts, followed by privileged debts such as salaries and social charges, and finally ordinary creditors. The latter will probably receive a dividend of a yet to be determined percentage of their claims. The court appointed administrator, Mr. Philippe Lathion, will remain in charge of the process at the end of which the companies will be liquidated, and the funds invested by the shareholders ultimately lost. As this may be the final communique from the board we would like to express our regret for the outcome of the group and our appreciation of your support and understanding. For further information, please contact investor-relations@alevo.com and/or the administrator Mr. Philippe Lathion on plathion@duchosalberney.ch. Although the cover letter said this was confidential, I do not see why I should maintain confidential status. The term “supergrid” is not adequately descriptive. Especially since it has been used to describe several different scales of large grids. Loosely, supergrids must allow power sharing over a continental size area in order to work. Supergrids will enable a renewable based energy economy by spreading weather risks between at least three weather systems. The term “continental scale grid” or simply “continental grid” is actually more specific and descriptive. It is easy to imagine a European grid, an Asian grid, an African grid, an Australian grid, a North American grid, and a South American grid. Any such continental grid that is thousands of kilometers across must be a DC grid. This is because with any continental scale AC grid phase instabilities develop especially when an outage occurs in a major generator or a major powerline. There are still technological problems to be solved before such meshed hvdc grids can be built, yet it is well established that continental grids will need to be DC. If we build such continental scale DC grids, there becomes a large benefit to linking these grids together into a global grid. This will occur one step at a time, for example the European grid will ultimately link up with Asian and African grids to form a meshed hvdc grid that shares generation resources all the way from Japan to India to South Africa to the UK to Northern Europe and on through Siberia and back to Japan, and everything within that loop. One could call this the Eurasian-African supergrid but I see all such combinations of continental grids as steps that will ultimately be linked Into a global grid. Our great-grandchildren will thank us greatly if we have the foresight to make sure that every continental grid operates at the same voltage so that the ultimate global grid will be much less expensive to form by linking the continental grids. I propose the term “mesogrid” to describe the scale of DC grids that might link substations around a city. It is less important that such mesogrids operate at a common voltage. Currently substations are linked strictly by AC power lines.I envision the term mesogrid to refer to DC grids operating at voltages around plus minus 100 kilovolts. Mesogrids can greatly stabilize power supply within a city which is fed by multiple long-distance power connections. The elpipe needs to be based on sodium conductors to be economical. I came to this realization just before I signed an employment contract with Alevo. Jostein Eikeland prevented me from talking about this vital fact all during the time I was at Alevo. I think that was a mistake. Sodium is about a factor of 7 times less expensive than aluminum in the electrical conduction application. In prior art transmission projects the actual metal purchase price for the conductor is 1 - 2% of the total cost (including the cost of transformers and or ac-dc converters needed). Elpipes are envisioned as extremely efficient transmission lines; The default efficiency of elpipe transmission, for all my illustrative calculations shown in my various publications and on this website has been 1% loss per 1000 km. This is about 3 times better than the best previous major long distance powerlines, which are two overhead 800 KV HVDC lines in China. Such low loss is needed to construct a truly continental scale electricity grid. Such elpipes use way more metal than prior art transmission lines per kilowatt - kilometer; considering the cost of an entire transmission project, 15 - 25% of project cost would be for metal if the conductor is strictly aluminum. If the conductor in such a transmission project could be exclusively sodium (it cannot) the corresponding percent of total transmission project cost for the conductor drops to 1.87 - 2.31%. Even after including other vital conductive metal parts made of steel, copper, or Invar, cost for the conductive metal will still be low compared to an aluminum based elpipe, about 3 - 6% of total project cost. A continental grid based on elpipes would be billions of dollars less expensive if made primarily using sodium conductor. In order to have a renewable energy based economy, it is critical to have an electric grid that is larger than the largest expected weather system. The larger the area covered, the more likely it is that there are renewable energy generators in multiple different weather systems. Spreading the risk for wind turbines to be becalmed or solar generators to be shaded out across a very large grid enables renewable energy in aggregate to be far more reliable. Such a supergrid can get by with far less balancing resources than grids of today. Cost per unit conduction capability for any metal depends on these factors: cost of the ore per kilogram of metal produced, cost of refining the metal from the ore, and density of the metal. The major cost advantage of sodium over aluminum as the primary elpipe conductor is that much less energy is required per kilogram of sodium produced and the density of sodium is much less than that of aluminum. I advocate using sodium electrolyzed from sodium oxide derived from the carbonate (trona) as opposed to starting with sodium chloride. The chlorine byproduct that would be produced from making sodium out of sodium chloride would have unacceptable environmental consequences. Prior proposals that have been made to use sodium as a conductor had the sodium be contained within a polymer shell, which is also the electrical insulator. This is intrinsically unsafe in that a fire would be very hard to put out, and also repairing the line would be very difficult. Instead of this design, I have proposed that all the sodium conductor would be held within a strong steel or other very strong metal shell, and the shells correspond to the cars of the elpipe train. Today is the day before the Alevo SA general meeting in Switzerland. A lot hangs and the balance for me personally. I traded my patent rights in the elpipe and the ballistic breaker to Alevo in return for stock which was at the time worth $2 million in Alevo SA. Tomorrow it will be decided whether Alevo continues as a going concern or whether it declares bankruptcy in Switzerland. Alevo Manufacturing and Alevo Inc. have already declared bankruptcy in the USA. These are wholly owned subsidiaries of Alevo SA in Switzerland. Because some debts of Alevo Manufacturing contract back to Alevo SA, there is some doubt about whether Alevo SA will also go bankrupt. If that happens all my elpipe and ballistiic breaker patents will be auctioned off by the court. Part of the background here is that the major shareholder of Alevo presently is Dimitri Ryobevlev, who put it in about $300 million to keep Alevo afloat when early projections about getting the factory working in 2015 (at the latest) proved to be overly optimistic. In fact I went on medical leave before Dimitri really took over, but from what I heard, the folks that Dimitri sent over to take charge of Alevo Manufacturing did a really good job in the beginning. They got rid of people who were not doing their jobs and I think that Alevo began to focus more on getting manufacturing to work right. One of my big gripes with Alevo Manufacturing was the lack of an entrepreneurial mindset. I saw this from the standpoint of an observer, as my job was to develop ballistic breakers and elpipes; but within the walls of Alevo I was able to talk to battery people about their frustrations. I also made a number of recommendations on problematic polymer films in the battery, especially the cell wrap film. I am certain I was at the time the best polymer scientist in Alevo, and my proposed solution would have saved $2.50/cell on the bill of materials. None of my films were ever tested. What Went Wrong at Alevo? The biggest single mistake Jostein made was thinking that it would be easy to go from the lab to manufacturing batteries. Instead of setting up an entrepreneurial group of scientists, engineers, and techies working together to get that first production line working, Jostein instead installed an entire team of managers. The bureaucratic drag slowed progress in every imaginable way. Alevo didn't think they were tackling a big technology challenge; if they had, they surely would have equipped the lab first rather than last. It should've been driven by engineers and creative people. It was a terrible mistake to bring in in the top managers from Jostein's previous magnesium company (sometimes referred to the “Michigan Mafia” within Alevo). There's a mindset that goes with a manufacturing business where technologies are all figured out. Magnesium die casting has minimal technology risk: it's mostly business risk. The founding management team were managing business risk, not technology risk. The folks who started Alevo Manufacturing also got off on the wrong foot with the German research folks. This got better when Jostein hired Alan Greenshields (currently CTO), formerly CEO of Fortu (the battery company from which the Alevo battery technology came). Alan was very much harmed in the takeover of Fortu by Alevo, But since he has was hired he has worked tirelessly to get the manufacturing operation working properly. Alevo filed for chapter 11 bankruptcy last Friday. They were on the verge of shipping the first full GridBank. I wish them the best especially since I'm a shareholder. Also I think their technology is incredibly important. I shall henceforth go on blogging about the elpipe and the Ballistic Breaker without concern for Alevo’s previous demands that I not blog about this. I wrote the following blog post on May 18, 2017 . That was the day that I went on permanent disability from Alevo Inc. I am Roger Faulkner, primary inventor of the elpipe and the Ballistic Breaker. I have been ill for a few years now, starting in September 2013, and getting seriously ill in 2014 (I was hospitalized and nearly died in May/June of 2014, shortly after I joined Alevo on April 1, 2014). I was diagnosed with Amylotrophic Lateral Sclerosis (ALS) in August 2015. I have gone onto long term disability. I have not been active on this blog site since I joined Alevo, mainly because Jostein Eikeland, who is the primary founder, asked me to essentially stop posting. The reason was so that we could pull the development under the corporate veil until we had a prototype to show; however I never got a realistic budget to pursue my inventions. This happened because commisioning of the battery factory proved to be much harder than expected, and that sucked up all the money. It did not work out as Jostein envisioned, but I thank him from the bottom of my heart. I was at the end of my rope in 2014 when Jostein found me, and the deal we made allowed me to pay my medical bills and live well these past few years. I am also now a stockholder in Alevo, and I think that could still work out pretty well. Clay Taylor, who works with me, suggested we create a wordpress wiki that discusses the future grid. We think it is unavoidable that the future grid will be all DC; I think many of you will agree that in 100 years, the grid will be DC. That implies a transition; few would predict that the transition to DC would occur within 20 years (I think that 30 years is possible). It seems to me that most tech-savvy observers would agree that a transition to a fully DC grid will occur between 20-100 years from now, So lets discuss this! Some of my past posts, especially my discussions of ground return currents, would logically fit into this new website, which will be DCgrid.network. As of today, that url just forewords to this blog post. I'd like to hear from you if you are willing & interested to participate. Clay Taylor will be webmaster, and both he and I will be regular contributors. In various posts on this site, I have included snippets that originated from various luminaries in the development of DC technology, starting with Bill Long at UW-Madison, who was my expert witness in the 1991 Wisconsin Public Service Commission Advance Plan 6 hearings, but also including Gunnar Asplund (formerly in charge of HVDC development at ABB), Stig Nilsson (currently a VP at Exponent), and others. This wiki will be gently moderated, but I'm not looking to exclude folks who disagree with me. I hope to create a lively conversation, based in science and technology, but also willing to look at things like cost of right-of-way (ROW) and cost of legal fights around obtaining ROW (this is relevant because it is easier to put DC power underground for great distances than AC). Also discussion of other environmental and health effects of DC versus AC power might be nucleated there if an appropriate expert comes forward to focalize that. I was surprised to find out that this blog post had more hits than any other blog post on my site. That may be because of the link to the website DCgrid.network. Due to my illness I never got this wiki going. I am looking for help to moderate a wiki to discuss the future DC grid. Mesogrids are proposed DC grids positioned between large long distance transmission lines or central generators and smaller distribution substations, up to the scale of backing up a city power supply. The concept was introduced by Steve Eckroad of EPRI in a patent[i], mainly directed at protecting an urban area from a rolling blackout, but the same basic design also facilitates two-way energy flow due to distributed generation, and increased use of shared, non-local energy storage. This patent describes a mesogrid sized for an urban area, taking the form of an HVDC loop around a city, connecting all the major transmission substations around the city by DC. Eckroad envisioned high temperature superconducting (HTS) lines to accomplish the DC connection, while we envision conventional conductor-based HVDC mesogrids based on elpipes[ii], overhead lines, and cables. Elpipes are polymer-insulated metallic extrusions, linked through flexible couplings, which run on wheels within a pipe, which are being developed by Alevo. Current for an elpipe can be much higher than a cable, simply because more aluminum/meter can be used economically with the elpipe design. Elpipes make it feasible to transmit more than 6kA, allowing GW-level transmission at 80kV. If elpipes form the backbone of a mesogrid, resistive loss through the mesogrid conductors can be kept below one percent. Mesogrids are between current AC grids and typical microgrids in size and voltage. As with DC microgrids, mesogrids facilitate two-way energy flows in a system containing a lot of distributed generation. Mesogrids are distinct from DC microgrids both by moving more power and because they may link into the AC grid at multiple different substations. Like the future supergrid, mesogrids are envisioned as DC grids that parallel and reinforce the AC grid. Mesogrid voltage will typically be around 80 kV, and represent an evolutionary step towards a future supergrid, at voltage levels which are safe and compact, yet realistic for GW-scale transmission. Systems that could be powered by mesogrids range from a large industrial or data center complex, to a city, or a region with numerous energy farms and energy storage sites. Optimum voltage for mesogrids is well below typical HVDC transmission voltage (300-800kV). Like the future supergrid, mesogrids are envisioned as strictly DC grids; voltage will be most economical for the envisioned applications around ±(30-180) kV, which places them in the voltage range bridging between MVDC and HVDC. Power levels at ±40kV can conveniently be 2 GW (6250 amps) if the connections are based on elpipes (lower power mesogrids could be based on cables). This work demonstrates the utility of mesogrids at several power levels, including urban area power reliability enhancement as originally proposed by Steve Eckroad. Mesogrids also make sense as “collector buses” serving several renewable energy farms and energy storage facilities (such as batteries, dispatchable hydro, and pumped storage) as well. By aggregating distant energy farms with several different time-scale storage devices, mesogrids can deliver firm renewable energy at lower aggregate cost than if each energy farm had to firm its own power. In rural areas, segments of a mesogrid loop to serve remote energy farms and storage sites might be overhead lines, though at 6kA as would be required for a 2-4 GW mesogrid loop, multiple parallel overhead lines would be required if part of such a loop is implemented via overhead lines. Because of their high ampacity, elpipe loops are particularly good candidates for initial application of mesogrid technology. Elpipes are high capacity segmented DC conductors that are based on polymer-insulated pipe-shaped conductors (think bus pipes) rather than wires; the segmented nature of elpipes allows far more conductor per meter of line to be used than is possible for cables, which must be able to wrap on a reel. Elpipes are capable to carry much higher current than cables or overhead lines. By moving high capacity DC transmission underground, elpipes make installation of a mesogrid linking substations in an urban area more politically feasible. Unlike cables, elpipes will be readily repairable, as they sit on wheeled carriages inside underground pipes. Elpipe repairs can be made rapidly by swapping out faulted segments, and the elpipe will not have to be dug up for most repairs. At a smaller scale, mesogrids are an ideal way to distribute power in a DC power environment. The main high-current connections of a mesogrid could be overhead DC lines, elpipes, gas insulated lines (GIL), or HTS lines. If maximum current is 2kA or less, mesogrids based on HVDC cable are also feasible. We present as an example of such a small mesogrid, a datacenter. a region with numerous energy farms and energy storage facilities, where the DC grid enables firming of power from several energy farms and energy storage facilities, where the primary advantage is due to being able to firm power with less total energy storage online. These three cases represent realistic size scales as particular examples of mesogrids. The smallest mesogrid, Example 1 corresponds to a demonstration project at Alevo's 2000-acre North Carolina factory campus that would be capable to provide fully backed-up, high quality (low voltage fluctuation & low transients) DC power to 100 GW of new advanced industrial and datacenter loads, with high reliability and power quality guaranteed by on site back-up resources. Example 2 extends the mesogrid to the region around our factory (the town of Concord, NC or the city of Charlotte; not yet decided), via elpipe links and VSC AC/DC converters at numerous substations in the town of Concord, NC. Finally, Example 3 considers a mesogrid extending around a city with high solar penetration and nearby wind farms (site not picked). These cases are not modelled in full detail, but thoroughly enough to visualize the cost/benefits at each scale. Any DC grid with power levels over a megawatt has a significant problem with circuit protection, and circuit protection generally costs much more than for an AC grid at the same power. In order to simplify modeling, all mesogrid cases analyzed use a single DC loop (MVDC or HVDC), as shown in the cited EPRI patent; there are both main loop circuit breakers (rated for maximum power of the entire loop), and fast disconnect switches on the main loop between every pair of power taps. One can obtain the n-1 redundancy level for every tap on such a loop, by placing a circuit breaker between every next neighbor set of power taps on the mesogrid. Such fast isolation is very expensive if the main loop circuit breakers are based on power electronic hybrid breakers capable of operating within a few milliseconds; for full redundancy one would require as many full-load circuit breakers as there are power taps. We consider an economically optimized solution for each power level, in which there are only a few full-load circuit breakers on the main loop, supplemented by fast main loop disconnect switches between each next-neighbor pair of power taps (AC/DC converters). In addition, each AC/DC converter is protected by relatively small circuit breakers. It is not enough to just have HVDC circuit breakers at each power converter, to isolate it from the loop; for full protection and self-redundancy, one needs main loop circuit breakers and those must have higher capacity. Take as an example a 10 GW loop with ten power taps, each with capacity from -2 GW to +2 GW. Ten 2 GW breakers will not be adequate for self-redundancy; one needs main loop breakers rated at 10 GW BETWEEN the power taps, which increases the cost by a factor of 5 (approximately). Thus, a lower cost HVDC circuit breaker is crucial. Any circuit breaker for this application (HVDC supergrid) has a severe problem with current inrush in a fault. ABB in their hybrid breaker design has used a large inductor to delay the current inrush long enough to open the fast mechanical switch far enough to prevent re-striking. Unfortunately, an inductor stores energy as it slows the current inrush, and all this stored energy must be dissipated to open the circuit. A second way to slow the current inrush in a short circuit condition is via a superconducting fault current limiter (SCFCL). There are numerous patents in this area, and several known approaches to trigger the quantum mechanical transition of a superconductor to a conventional conductor or semiconductor. 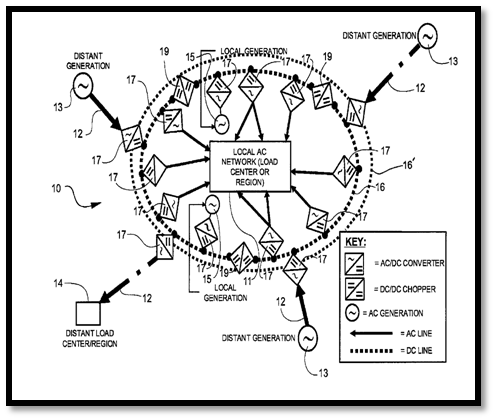 I believe the efforts of Paul Brown of Varian Semiconductor (now part of Applied Materials) are particularly promising, as Applied Materials is a new participant in this market, with no vested interest in the status quo, Here is Varian's recent patent. The use of SCFCLs as part of HVDC circuit breakers of other designs will reduce the cost of the main breakers by decreasing the maximum current that can develop before the circuit breaker completes its action (and therefore reducing the maximum rated current and voltage of the primary breaker). Part of what is needed is to be able to carry a lot of power (10+ GW per line) in an underground transmission line; my solution for that is the elpipe, a sort of mashup of a powerline, a pipeline, and a train. I am now engaged in making elpipes (for underground HVDC transmission) and Ballistic Breakers (lower cost HVDC circuit breakers) work to make this vision possible. I have the support of a visionary investor (Jostein Eikeland) and his amazing startup company (Alevo) behind me. It will not be easy, but it looks feasible to me, from the inside. be strictly sited in ships or preferably submarines. The entire plant, or at least the reactor should be movable. This would greatly facilitate decommissioning, and siting well away from cities. One could also move the reactor around where it is needed. Move the cooling of nuclear power plants away from evaporative cooling and towards direct cooling with deep ocean water in such a way as to cause upwelling of nutrient rich water, increased precipitation in targeted areas (to increase available runoff or winter snow), and to increase thermodynamic efficiency of the power cycle. We should have pursued the thorium 232 to uranium 233 break even breeder cycle. This obviates the need for enrichment plants to produce fuel. The total number of loose neutrons produced in U-233 fission is reduced compared to U-235 or Pu-239, meaning less total radioactivity. The US Navy has a great safety record, and possesses great designs for modular nuclear reactors. Why does the whole debate on "modular nuclear reactors" ignore that? How is the idea novel? Why not use what we've got? I have not even seen a peep about what I consider the best option: building complete power reactors in submarine hulls that rest on the ocean floor in water just deep enough to be immune to surface storms. I'm pretty sure that the resultant upwelling can be managed so as to produce pockets of ocean fertility. When I learned about LENR reactions of H + Ni I was struck by the fact that no thermodynamic laws were breached, so I think this may be real. That would certainly be a game changer...but if true, we would soon be confronting thermal pollution on a grand scale. We would still need a supergrid in that scenario, but for a different reason (to put the waste heat where it belongs). Too bad the whole nuclear debate is so stale. Some new ideas could possibly break through the impasse. I have linked HERE to an ABB presentation on their new 525kV polymer-insulated cables. Great work! This article from the Charlotte Business Journal says that ABB's Hunterville, NC plant will be making this cable, which surprised me a little. I would have thought this would be applied first to subsea cable, which can have thicker insulation due to its large-diameter reels. From a practical point of view, this extends the range of elpipes to also include very thick cables (similar in diameter to subsea cables, but potentially much less expensive because of lacking armoring and tow-strength layers). The recently announced breakthrough by ABB on 525kV undersea cable makes this all the more important. I blogged about the "wheeled cable concept" previously. This method could also be used to string a spliceless superconducting line across a continent, in principle.